(Beverly Hills, CA, January 29)–Filmmaker and DMG Entertainment Founder Dan Mintz announced today that the company has acquired Valiant Entertainment, the third largest universe of superhero characters in entertainment, sitting alongside Warner Bros.’ DC Comics and Disney’s Marvel. Mintz has held a significant stake in Valiant since 2014. By taking complete ownership of Valiant’s library of over 2,000 characters, including X-O Manowar, Bloodshot, Harbinger, Shadowman, Archer & Armstrong, Ninjak, Faith and more, Mintz looks to further secure his filmmaker-run studio with a treasure trove of world-class intellectual properties and establish DMG as one of the most valuable and innovative media companies in Hollywood. Valiant’s well-earned reputation as an influential, story-centric force in comic book publishing with one of the most impressive rosters of creative talent in the industry will be substantially broadened by DMG. DMG’s expertise in monetizing the global marketplace positions Valiant not only in the cinematic and publishing landscape, but far beyond, increasing the emotional touchpoints of Valiant’s A-list IP to an exponentially growing audience. 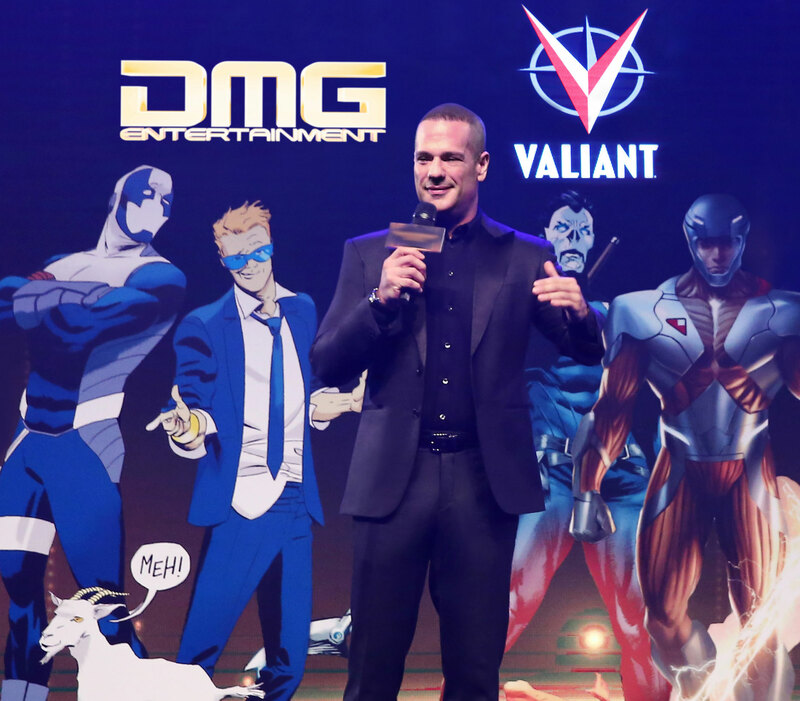 “As one of the most coveted and critically acclaimed contemporary libraries in the comic book medium, Valiant is poised to emerge as the global leader in multi-platform content under Mintz’s creative vision,” said Valiant Chairman Peter Cuneo. Current Valiant movie and television projects in development include the previously announced “Bloodshot” and “Harbinger” feature films from Sony Pictures, to be produced in partnership with Original Film; the television show “Quantum and Woody,” produced in partnership with the Russo Brothers’ Getaway Productions; and a Dr. Mirage television series with CBS Studios and The CW Network. Additional feature film projects, including “Shadowman,” “Archer & Armstrong,” “Eternal Warrior,” “X-O Manowar” and others yet to be disclosed publicly, are also well underway. Mintz has a strong track record when it comes to producing and financing global IP, including Marvel Studios’ “Iron Man 3” and the acclaimed sci-fi thriller “Looper.” Additionally, DMG has produced numerous major motion pictures, including its recent partnership with James Cameron and Studio Canal to reimagine “Terminator 2” in 3-D for global theatrical release. DMG’s upcoming feature films include “Chappaquiddick,” starring Jason Clarke and Kate Mara, and “Blockers,” starring Leslie Mann and John Cena; both films will hit screens worldwide in 2018. DMG Entertainment is a global media and entertainment company with diverse holdings and operations across motion pictures, television, comic book publishing, gaming, next-gen technology and location-based entertainment. An entertainment powerhouse valued at more than $6 billion, DMG Yinji is publicly listed in China. The studio’s films include the critically acclaimed sci-fi time travel hit LOOPER and the global blockbuster IRON MAN 3. Later this year, DMG and James Cameron will bring TERMINATOR 2 back to the big screen in an immersive 3D special edition. Other upcoming releases include BASTARDS with Owen Wilson and Ed Helms, John Curran’s CHAPPAQUIDDICK and THE PACT Starring Leslie Mann and John Cena. Valiant Entertainment is a leading character-based entertainment company that owns and controls the largest independent superhero universe in comics. With more than 80 million issues sold and a library of over 2,000 characters, including X-O Manowar, Bloodshot, Harbinger, Shadowman, Archer & Armstrong, and many more, Valiant is one of the most successful publishers in the history of the comic book medium. Today, the company’s characters continue to be forged in publishing, licensing, film, video games, and beyond. Valiant consistently produces some of the most critically acclaimed comics in the industry and has received numerous industry awards and accolades, including a Diamond Gem Award for Comic Book Publisher of the Year. Valiant also recently announced a multi-picture deal to bring Bloodshot and Harbinger to the big screen as feature films. Visit them online at ValiantEntertainment.com.